We will soon be launching a new initiative to help improve early diagnosis for lung cancer and other respiratory conditions across north and east Manchester. 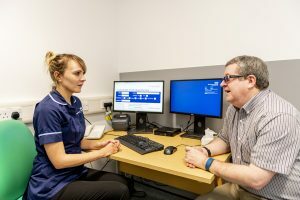 Manchester’s ‘Lung Health Checks’ will tackle poor early diagnosis and survival rates for lung cancer by providing quick, easily accessible screenings for those deemed at higher risk of lung conditions. The project will utilise ultra low-dose CT scanners in first-of-their-kind mobile units, delivered in partnership by Wythenshawe Hospital, Manchester Health and Care Commissioning (MHCC), Cobalt and Siemens Healthineers. From next month (April 2019), Lung Health Check support units and CT vehicles will be placed in key community-based locations across north and east Manchester for the next two years. The first location is at the Etihad Campus, Manchester City Football Club’s stadium, where participants will be able to attend on selected dates – outside of match days. Those eligible for screenings – smokers and former smokers aged between 55 and 80 – will receive a personal invitation for a Lung Health Check from their GP. The resident will arrange a suitable date and time to attend their nearest Lung Health Check site where a nurse will ask them some questions about their lung health and carry out a simple test to measure the amount of air in their lungs. The specialist will then use the results to determine if the resident will benefit from having an ultra low-dose CT scan. If so, this scan can then be done immediately in the purpose-built mobile unit, and would take only a few minutes. The check will only take around 30 minutes in total. Dr Richard Booton, Clinical Director of Lung Cancer and Thoracic Surgery at Wythenshawe Hospital, said; “Lung Cancer is the leading cause of premature death in Manchester and a major issue in the treatment of lung cancers is that they are often not identified until a late stage, at which point the chances of survival lower significantly. “This new initiative allows us to test people who are at a higher risk of lung conditions, regardless of whether they’ve noticed any symptoms, enabling us to diagnose lung cancer and other respiratory conditions at a much earlier and more treatable stage. Tests are quick and non-invasive, and located in easily accessible areas in the community. This new service follows the success of the community-based pilot in 2016 – a partnership between Wythenshawe Hospital, Macmillan Cancer Improvement Partnership and the Manchester Clinical Commissioning Groups. During this pilot, 65 lung cancers were detected, equating to one lung cancer for every 23 CT scans performed. Of these, eight out of 10 cancers were detected at early stage, allowing curative treatment in 90%. The four Lung Health Check sites will be at Etihad Stadium, Cheetham Hill, Harpurhey and Failsworth.